The Augustinian order has been serving Limerick city since 1633, even earlier in the county when the original monastery was in Adare. After the dissolution of the original foundation in Adare by Cromwell the Augustinians eventually moved into the city and the present church in O’Connell Street was built in 1942. The original church in the Adare foundation, sometimes known as Black Abbey is the current Anglican church for the parish of Adare. The current Augustinian priory in O’Connell Street is to the left of the church. It was formally known as the ‘Country Club’, and came into the possession of the order in 1946. Built in 1825, the Augustinians rented the ground floor of the premises in 1897 for £2,075 from Dr Pryce Peacocke for a lease of 999 years. The Augustinians paid £15,000 for the building in 1946. The priory was officially opened on 25th May 1948. On the right as you enter the church from O’Connell St, is the original lintel stone dated 1633 from the order’s first chapel in Limerick at Fish Lane. The O’Doherty family saved this stone in 1933 when the buildings in Fish Lane were knocked for new houses. 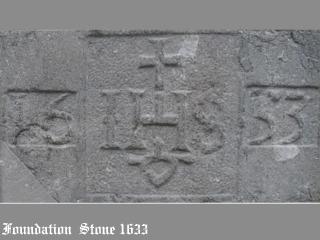 The stone was kept in their stone-cutting yard until brought to the attention of the Prior, Fr Vincent Lyons in 1961. 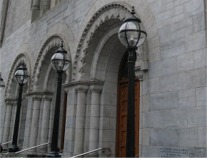 Fr Lyons bought the stone and in October 1962, it was inserted into the wall of the church. In the porch of the church, there are two holy water fonts from the church in Creagh Lane. These holy water fonts were in Creagh Lane from 1823 until the present day church was opened in 1941. The original proposed facade (right) had two towers – due to legal issues at the time only one was built. Inside the church, there is a booksop on the left and a Pastoral Centre on the right. Also on the right is a painting of the Ascension by Thomas Collopy, a Limerick man. This painting, dated 1782, originally hung in the chapel in Creagh Lane. Interestingly… In 1998 a silver chalice was discovered in a cylinder at the back of a safe behind the high altar. According to the inscription, Dame Alice Nagle donated it to the Augustinians Sisters in Dublin in 1750. A graveyard associated with the Augustinians is in front of the Old County Courthouse in Merchant’s Quay, Limerick. The bells of the church are believed to be originally from London. According to the story, an elderly officer was living in retirement in London and each evening he listened to the bells in a nearby church tower. Then one evening, the bells did not ring and he heard that the tower was being knocked. He bought the bells and moved to Ireland where he built a replica of the tower. Fr Larry A. Doyle heard the story and bought the bells for the new church in O’Connell St. Each of the seven bells was given a name of dedication and a prayer so that the chimes of the bells may inspire the people who heard them.